IT'S TIME TO RENEW YOUR CREDENTIAL FOR 2019! To renew online, log in to your account and follow the prompts. To renew via mail, download, and complete the Application for Credential Renewal form and mail it to the TMCA Vice Chair, Credentialing, at the address shown on the Contact Us page. We are pleased to announce that TMCA's 15th Annual Symposium will be held Saturday, October 26, 2019, from 8:00 am until 4:45 pm at the South Texas College of Law, Houston. More details to come. We will have a room block at the DoubleTree by Hilton Houston Downtown for $129 per night. If you are a current Credential holder, watch for an email coming soon with hotel room booking information. Standard hotel WiFi is free with this room rate and parking at the hotel is $24/night. Parking is valet-only. The hotel's address is 400 Dallas Street, Houston, TX 77002. It is about a four-minute drive from the hotel to the South Texas College of Law. Check out our center-spread ad in the June 2018 issue of the State Bar of Texas' Bar Journal! Every year since 2007, TMCA has placed an ad in the Texas Bar Journal listing all current Credential holders. This exposure to more than 100,000 Texas attorneys helps fulfill TMCA's mission to "Promote Quality Mediation Throughout Texas." As a followup to the mailing of TMCA's Mediation Benchbook, Second Edition to more than 1200 District, County, Federal, and Supreme Court judges in 2017, TMCA mailed an updated list of Credential holders to these same sitting judges in October 2018. Our 2018 “Supplement to the Mediation Benchbook” is another way TMCA puts credentialed mediators at the fingertips of influencers and decision-makers while fulfilling its mission to promote quality mediation throughout Texas. The Mediation Benchbook, Second Edition, provides Texas judges and others that utilize mediation a resource that includes mediation statutes, a sample mediation order, TMCA credentialing criteria, information about TMCA's grievance process, and the Texas Supreme Court ethics orders. The Benchbook is funded by your dues and an educational grant from the James W. Gibson Fund. 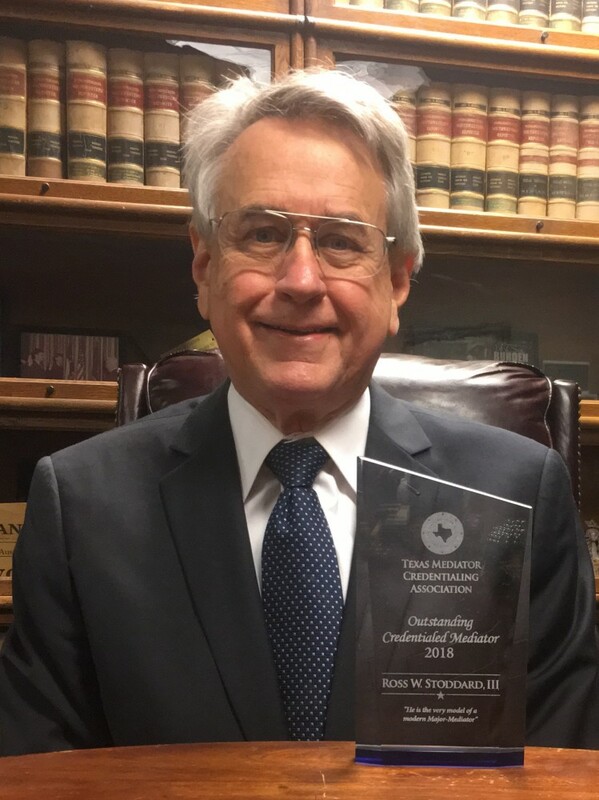 Ross W. Stoddard, III, Is Named TMCA’s Outstanding Credentialed Mediator for 2018!